Newly updated to incorporate the FDA Reauthorization Act of 2017 (FDARA), the FDCA Statutory Supplement, 2018 is the indispensable tool for FDA law practitioners. This publication provides cross-referencing of the numerous legislative amendments with the original statute, facilitating quick research and citation, and highlights recent changes through simple formatting. The appendix contains relevant portions of related statutes. 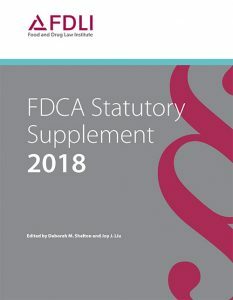 Access to an electronic version of FDCA Statutory Supplement, 2018 is included with each print copy.